Last year at this time I was basking in the sunny, warm climes of Mallorca. Having spent the last six years trading our endless winters for their much shorter and kinder ones, I decided last fall, that it was time to experience a different side of the island. The warm aquamarine ocean surrounding it. It was heaven… I swam in 30 degree water so clear that I could see crabs crawling along the sand 5 metres below me… in October. This has created a dilemma for me. 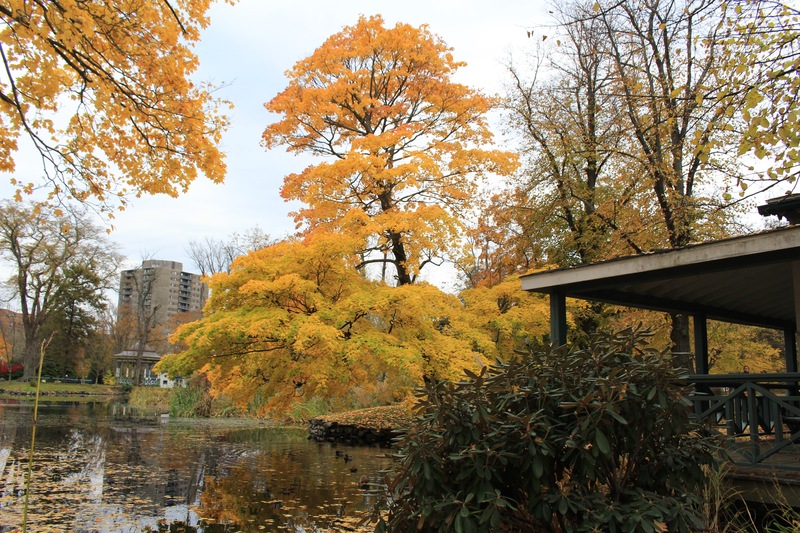 I can extend my summers but will have to forsake something that people travel to Canada from all over the world to see… the glorious changing of the leaves. 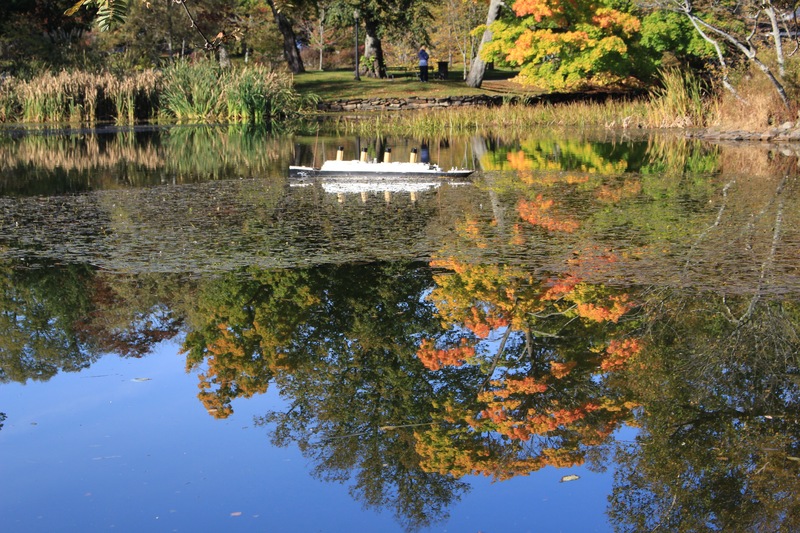 I love the fall… especially the beautiful crystal clear light, and the ever-changing colours of the trees. 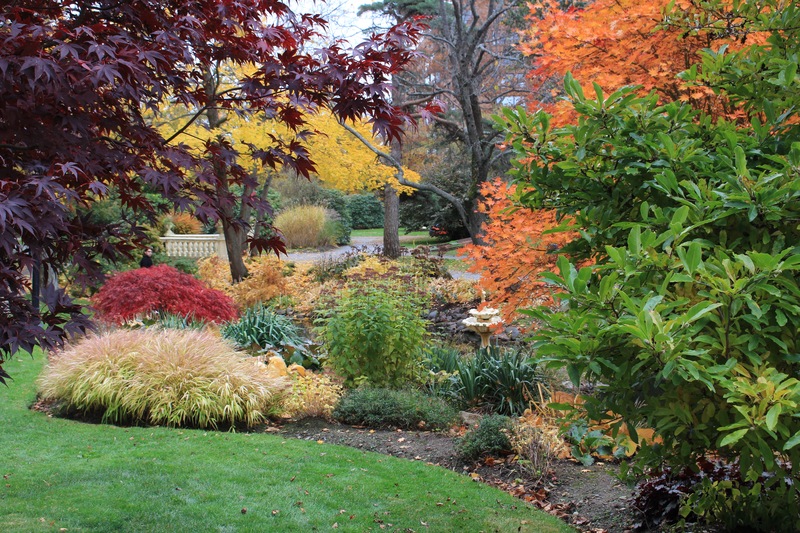 This year, my husband and I have been marvelling at the spectacular fall display. Was this a particularly fabulous year for colours or where we seeing it with ‘fresh’ eyes after having missed it last year? Maybe it’s a message telling us that here is were we belong in the autumn. 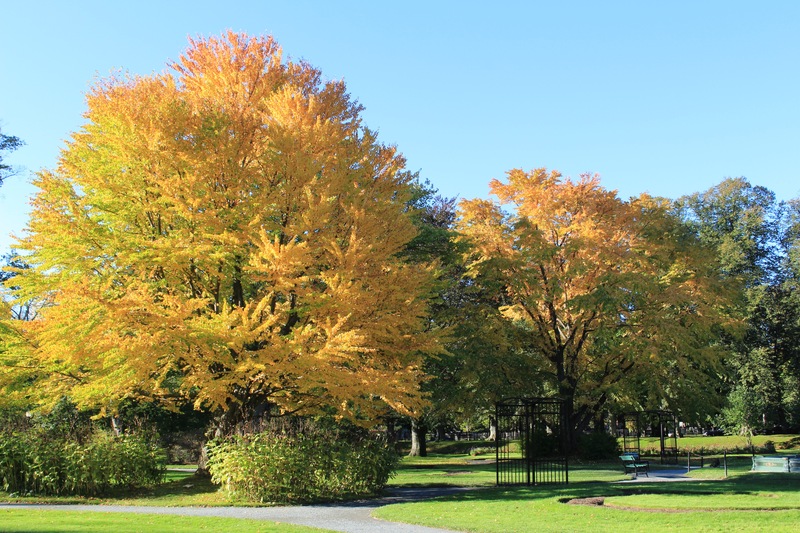 The Cercidiphyllum japonicum (Katsura tree) by the Victoria Jubilee fountain put on a stunning display with their coral tinged yellow leaves. The one by the smaller of the two Dahlia beds, turned weeks ago and have since lost their leaves. Not sure if it’s a different variety or if it senesces earlier due to its location or age. Evergreens also lose their leaves though not on a yearly basis nor all at once. They also change their leaf colours in cool weather. Some turn yellow, pink, red or orange before their leaves drop off. Those leaves that aren’t being shed often take on a purplish cast, due to a chemical reaction in the cell to protect them from freezing and exploding. Kind of like anti-freeze. 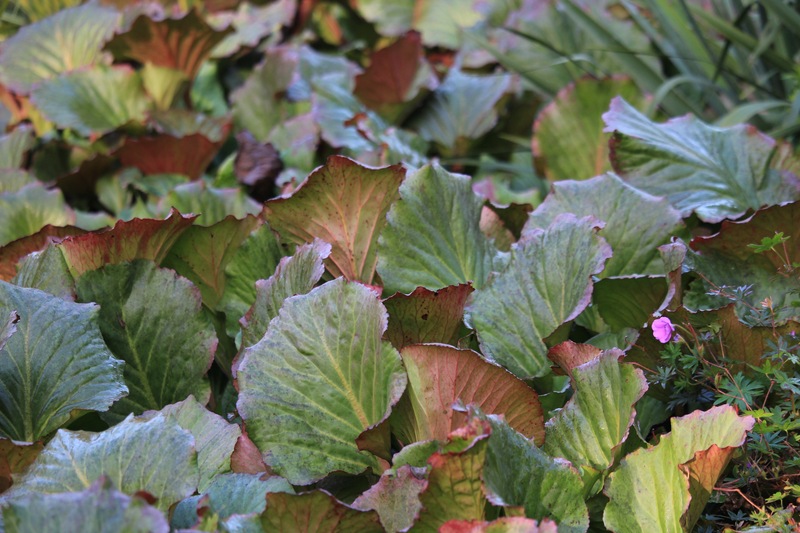 Bergenias (Elephant’s ears) are a perfect example of cold induced coloration of evergreen leaves. Berberis (Barberry) , Pieris japonica (Japanese andromeda) and an Acer (Maple tree), put on a coordinated display two weeks ago. The pink flower buds on the Piers will last all winter and open in the spring. 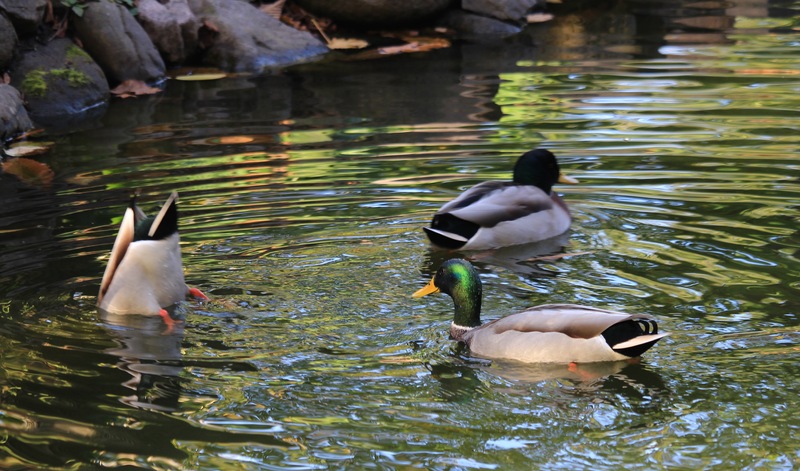 I’ve never seen a duck smile… he must have mischief on his mind. Click on the picture to enlarge it… he really is smiling! 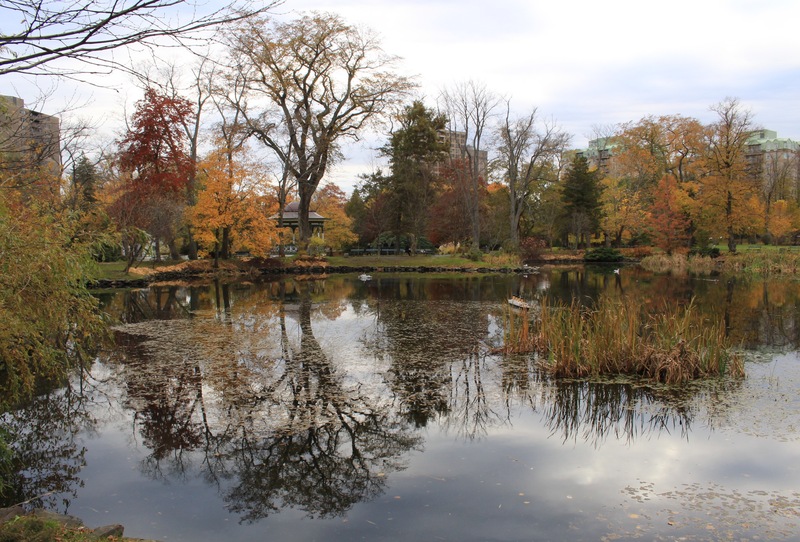 The Public Gardens came in second place in The Coast’s 2015 Best of Halifax for the Best Public Space. The Halifax Library replaced the Gardens as the perennial front-runner. In my books we’re still the golden one, though I think the library is great. The Titanic floats above it all on a still morning. This Acer (Maple tree) never fails to stun. The colours look even more vibrant in the reflection on the water in the previous picture . The grandest daddy of them all. One of the ‘original’ Ulmus (elm) trees planted in the Grand Alleé under the direction of Richard Power somewhere around 1875. 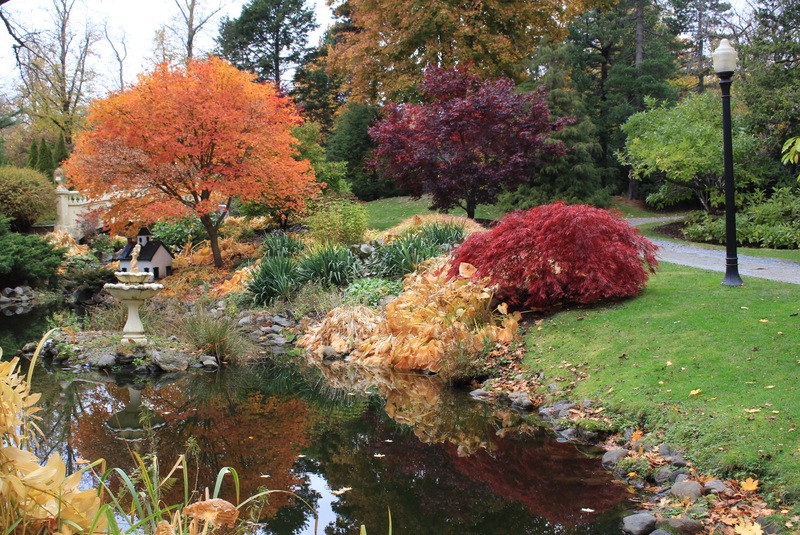 The mixed border planted along the stream bed after Hurricane Juan, contain many different varieties of Japanese maples (Acer palmatums) which change their leaf colour at the same time, creating an amazing fall palate. No matter what direction you look at it from. 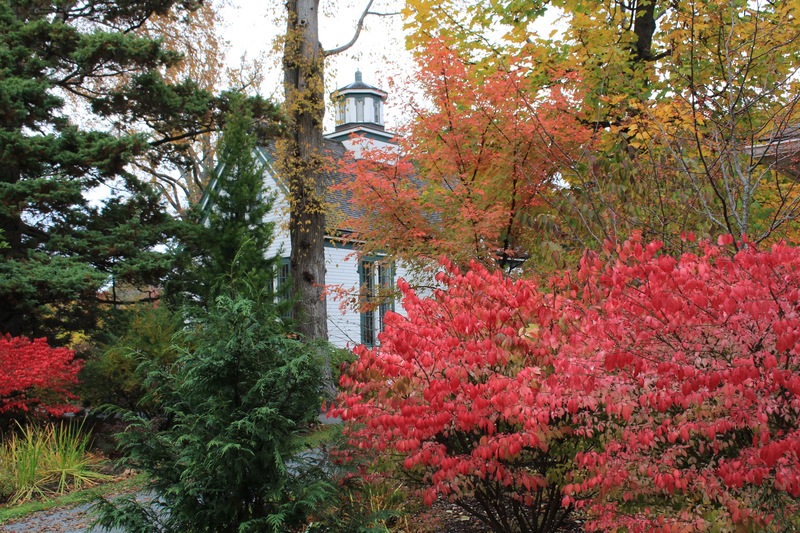 Euonymus alata (Burning bush)) and Acer griseum ( Paperbark maple) both turn spectacular colours during the fall. The maple tree has the added advantage of beautiful exfoliating red-brown bark. Changing of the guard. 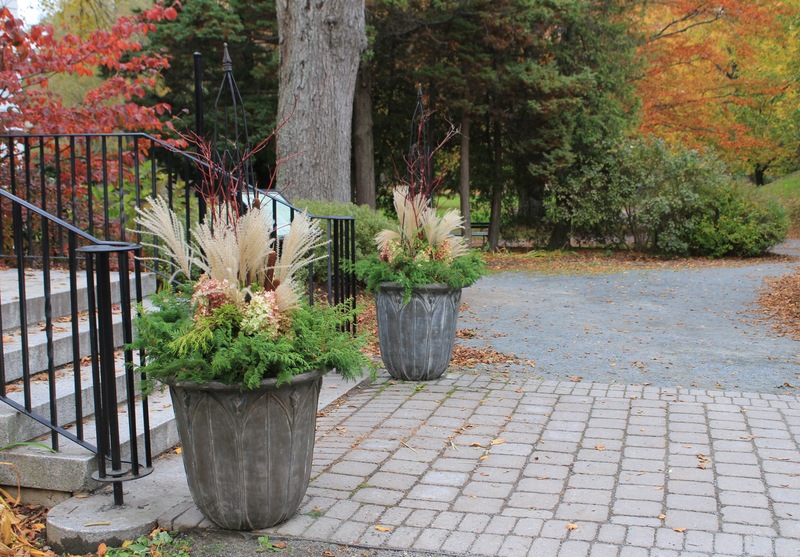 The containers by Hort Hall have been decorated for the fall/holiday season. Ready for the revellers. 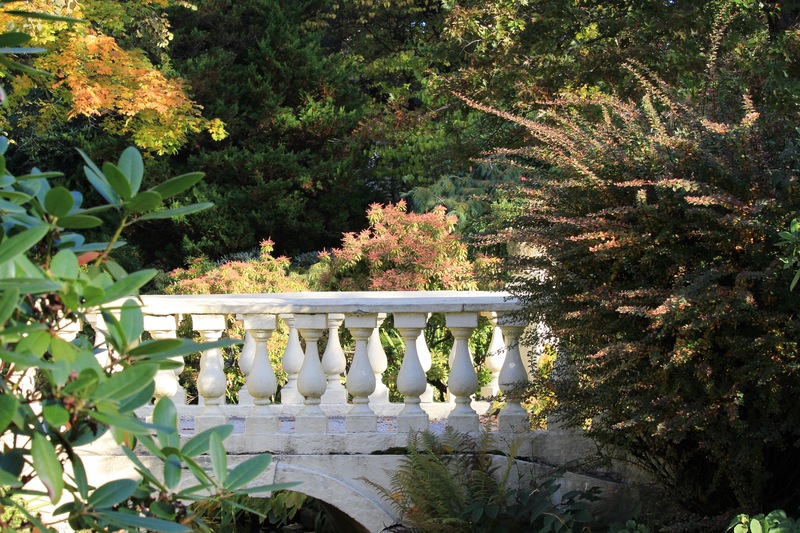 This afternoon around 4:30PM the Gardens will close for the 2015 season. It has been a glorious one though it started late. The blue heron came home to roost, our Dahlias brought us glory and the gardeners continued to do a brilliant job maintaining, and creating displays that continued to shine the entire season. Now those talented people go on to battle the elements in a much different way. They try to keep our streets and sidewalks clean and safe (a herculean task these last two winters). Thank you all for the back-breaking work that you do and for bringing us such pleasure. 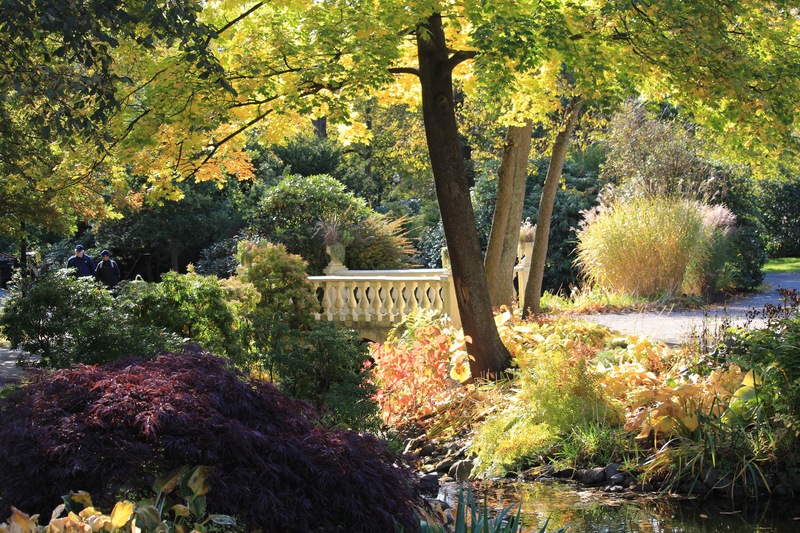 I’ll miss my chats with you as I wander along the Gardens path in search of inspiration. 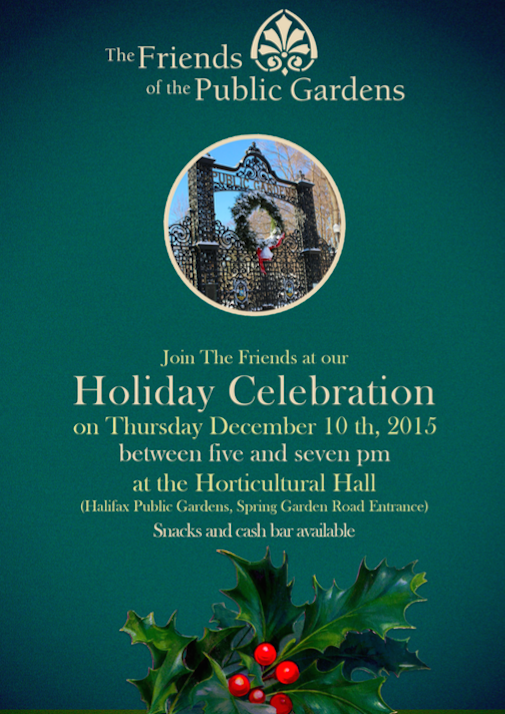 The Friends annual Holiday celebration will take place on Thursday, December 10 at 7PM. It’s always a popular event and if you haven’t made it yet, it’s worth a visit. Hope to see you then. This will be my last regular post of the season. Thank you for taking the time to read my blog and for the comments that you send me. Connecting with like-minded Gardens fans makes it all worthwhile. 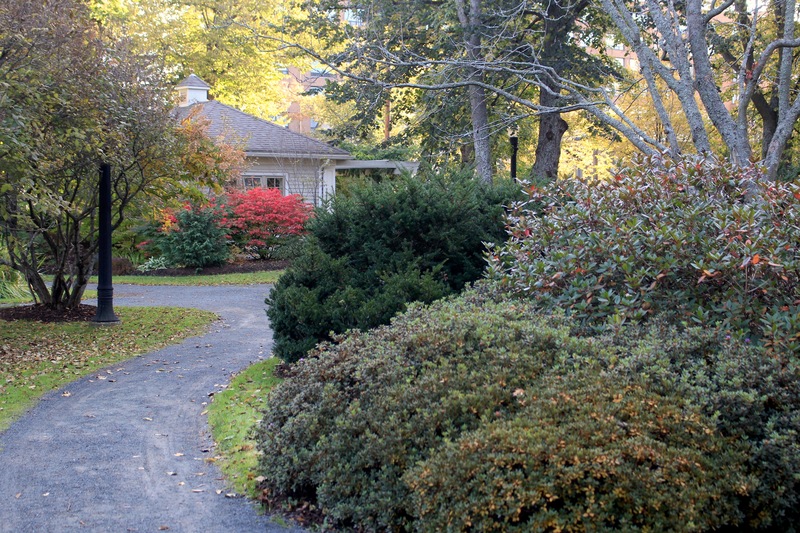 I will periodically post during the winter, though it will be unscheduled and probably outside the Gardens path. In the meantime Hasta Luego! All copy and images copyright © Serena Graham-Dwyer, 2015. If you wish to use any part or whole of an image, in any manner, please contact us.